AMLT's 6 month Beta period has ended! 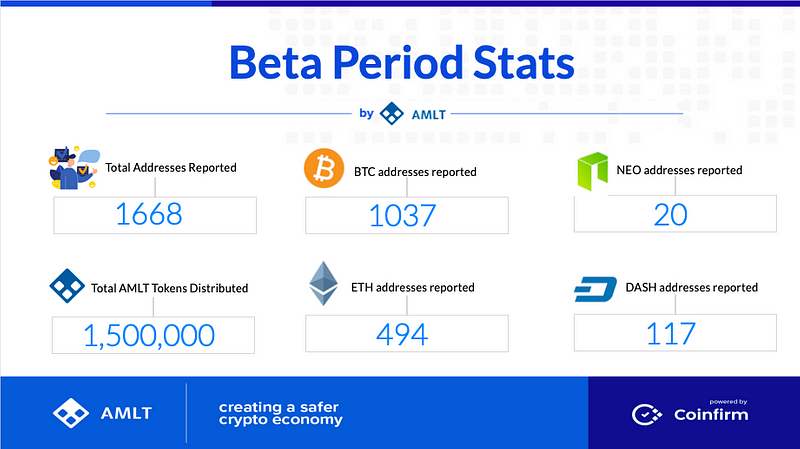 With that we’re releasing stats where a total of 1668 unique addresses were submitted into AMLT network. After due diligence and validation of these addresses a total of 1,500,000 AMLT Tokens were rewarded and earned by Network Members. Over the next couple weeks we’ll be sharing with you as a part of a roadmap the new features and releases post Beta period.In the graphic below you can see breakup of addresses by Bitcoin, ETH, DASH and NEO.